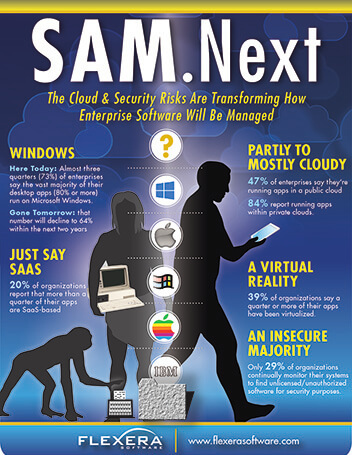 Software Asset Management (SAM) has had to continuously evolve since it was first introduced. Why? Because the software landscape today looks nothing like it did in the early 2000s. The cloud, virtualization, Software as a Service (SaaS) and mobility are redefining how software is delivered, how it’s paid for and how users access that software. The rise of the cloud, Internet-connected devices – (The Internet of Things), software vulnerabilities and cyber-crime are redefining what software asset management must entail. And software vulnerability concerns are driving SAM to the forefront as security teams – like SAM teams – must understand what software they have before they can understand whether they are exposed to dangerous vulnerabilities. Read this report to explore the changes in the software landscape and its implications for the next generation of SAM solutions – SAM.Next.